When it comes to spending time in the water, I love seeing the improvements that my kids have made over the years and just how much they enjoy splashing and swimming. They may not be the next Michael Phelps, but the laughter and the smiles as they jump in, kick around, and paddle back and forth brings a smile to all of us. 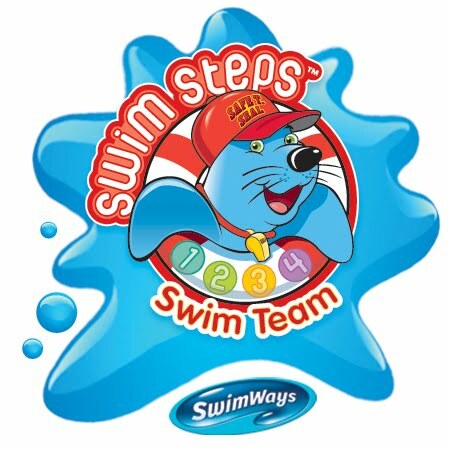 Thanks to the SwimWays Swim Steps review that we participated in a few months ago, my girls have had an even better time working on their swim skills and the confidence that they have received from using these high quality products has been wonderful. Instead of clinging tightly to my husband or me, they have the self-assurance that they can venture into the water on their own (with us still close by, of course). So where does that leave me? With the opportunity to get in a tiny bit of relaxation and enjoyment of my own... particularly with the SwimWays Spring Float Recliner and the comfort that it can provide. One of SwimWays' best-selling products, the Spring Float Recliner pool float includes a backrest, headrest and ottoman, making it an ultra-comfortable and relaxing way to lounge in the pool. This portable, quickly-inflatable item comes complete with its own carry tote and comes in three colors so that you can choose your favorite way to kick back in style. 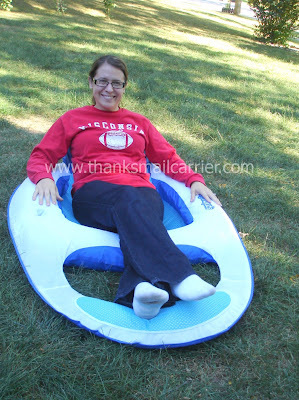 Considering that I'll take just about any excuse for some relaxation, when the SwimWays Spring Float Recliner arrived, I couldn't wait to plan our next trip to the pool. As I unpacked this float, right away I was impressed that something so large could fit down into such a small package. 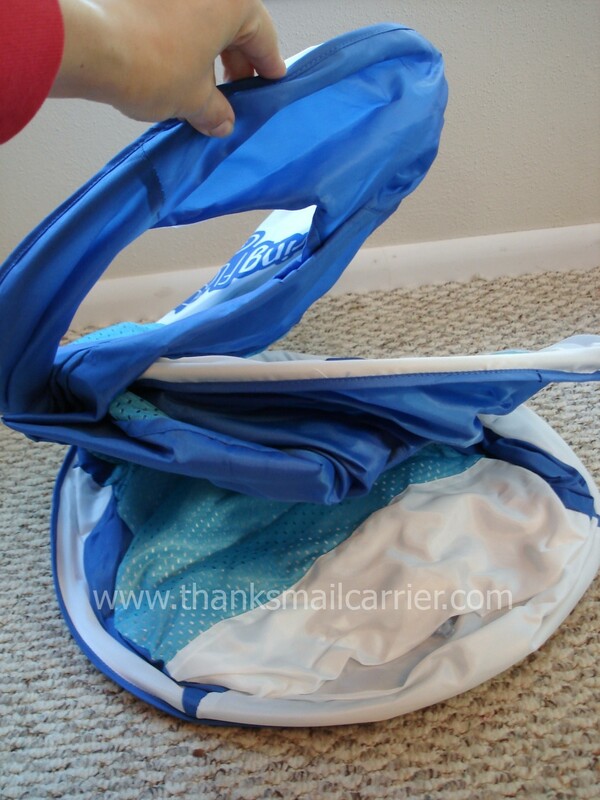 The mesh bag that comes with the Spring Float Recliner is just the convenient addition to keep it packed up for storage or to toss over your arm when carrying it with you. And when you get to your destination, whether that be the lake, the pool, or in your own backyard oasis, simply unzip, pull the float out and it pops right open. There are two nozzles for inflation/deflation on this Recliner and, as they feature Jet Valve technology, it hardly takes any time to have the entire thing blown up and ready to go. In about three minutes total, it was time to hit the waves. 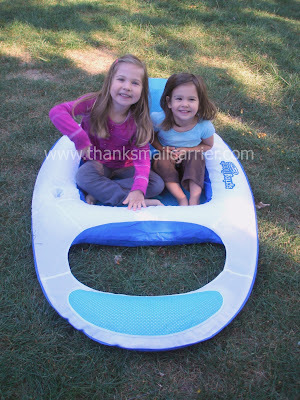 We were able to try out the SwimWays Spring Float Recliner in the water, however, as I was always in the pool, the pictures that I have of it are from the girls and I recreating the fun in our yard. I was slightly skeptical on just how comfortable this Recliner would be, but SwimWays definitely did not disappoint! The padded backrest is plenty strong enough that I can lean back and rest against the headrest, the ottoman is just right for my feet if I'm not in the mood to dangle them in the water, and the cup holder is thoughtfully placed so that my beverage is within reach. There isn't much more that I could ask for! Special thanks to Big Sister E for being my photographer! When it came time to fold up this float, it took me a time or two trying to remember how to twist and condense it at the same time, but soon I had it right back in the mesh bag and ready for next time. I appreciate that SwimWays even has a handy video showing how to fold it down just in case you find yourself wondering how it was possible that it fit right back inside. When it comes to enjoying the water, SwimWays has all of the products that you need. Their passion for creating toys, floats, games, and gear that help you make the most of your time in the pool provide entertainment as well as safety for the whole family. 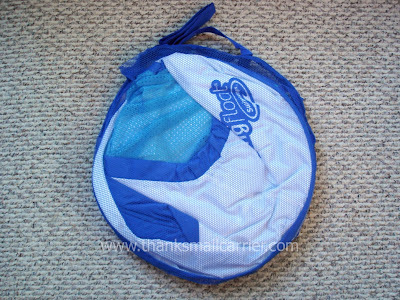 I'm looking forward to including them in our future summers as well as warm-weather trips - we'll definitely be bringing our Swim Steps items with us this winter when we head off to our beach vacation! 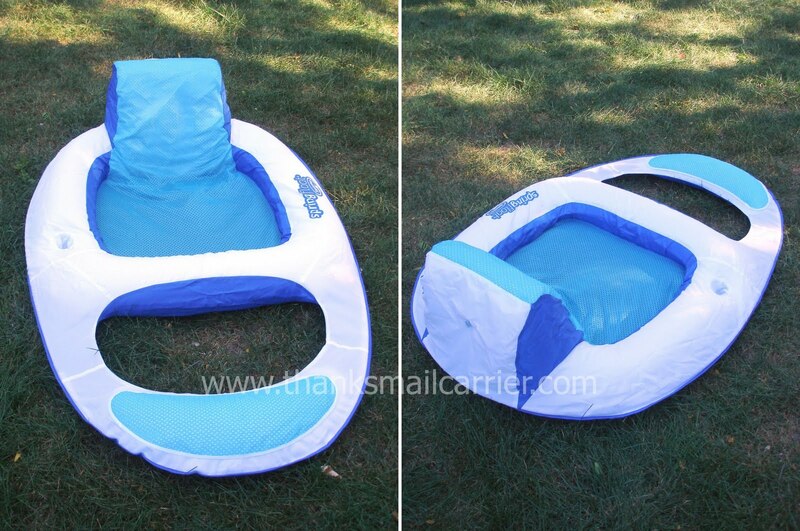 The SwimWays Spring Float Recliner retails for $45.95 and can be purchased directly on their website or from Amazon, so even though the weather has begun to cool off, now is still a great time to purchase one so that you'll be ready to hit the pool or lake next summer! Don't forget to also connect with SwimWays on Twitter and Facebook so that you won't miss the latest information and deals to help your family enjoy swimming and splashing. I love pool loungers like that!